"Help me come closer to God, by myself." Our children are our future. 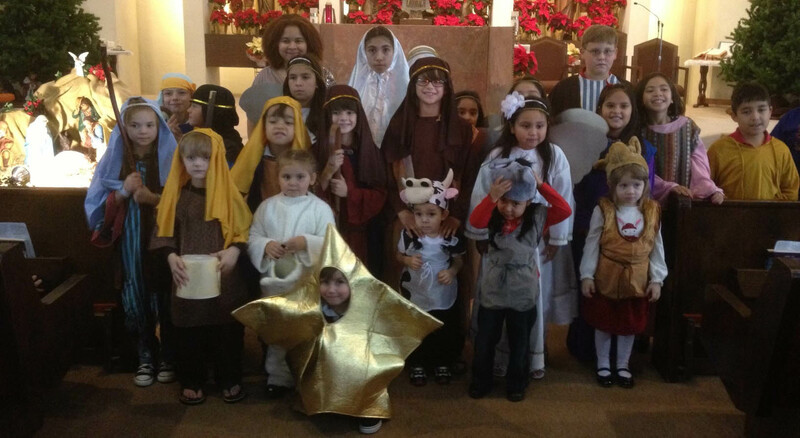 With this in mind, the Religious Education program at St. Paul the Apostle Catholic Church strives to teach the essential traditions and doctrines of the Catholic faith and to promote and encourage a love for Jesus and all of God's creations. We place a special emphasis on participation in the Mass and the need to care and respect others. We invite parents to become an integral part of our ministry; for parents of their children's primary catechist. Therefore, parents are invited to learn and refresh their love for God and the Church along side their children. God and the child have a unique relationship with one another particularly before the age of six. The growth of this relationship should be assisted by the adult, but is directed by the Spirit of God within the child. Children need their own place to foster the growth of that relationship. The child’s spiritual growth is best served through tangible but indirect means. An interpersonal relationship is always a mystery, all the more so when that relationship is between God and the child. We believe that there is a deep bond between God and the child which produces in the child the desire to draw nearer to God. The catechist’s role is to prepare the environment and to give selected presentations from scripture and liturgy that “call forth” the child’s response rather than “pours in” information. The catechist listens with the child and together they ask, “God, who are you? How do you love us?” The adult reflects with the child on the questions generated by the presentations with the materials offered to the child to aid the child’s reflection. How does the atrium help to nourish this relationship? The atrium can be compared to a retreat house facilitating recollection and silence. The atrium is a place for religious life, for community and worship—not a classroom for instruction. The atrium is a place of meaningful work through which the child can have a conversation with God. The atrium was the place in the early church where the catechumens were prepared. For the child, too, the atrium is a place of preparation for involvement in the larger worship community. The Materials in the atrium are often three-dimensional wood representations of a particular scripture or are items that represent what can be found in Baptism or Eucharist. They are attractively displayed and invite the children to explore and deepen their experience of the presentation at their own rhythm. The most important characteristic of the materials is there close link to the biblical and liturgical sources. The shelves might include maps of Israel and miniature environments representing the elements of the parables or the historical events from the infancy or paschal narratives that have been shown to satisfy the spiritual needs of the child. The model altar and its articles convey the centrality of the Eucharist. The Baptismal font and other liturgical items initiate the child into the liturgical life of the church.